Another home-baked component for the Apple pie? 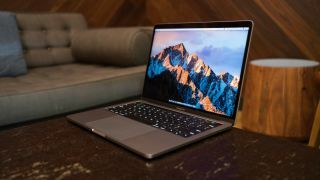 Apple is looking at producing its own ARM processors for its notebooks rather than relying on Intel CPUs for MacBooks. In the same self-reliant way it already makes in-house CPUs for the iPad and iPhone – it seems the company intends to produce all the chips for its devices. ARM-powered Macs is something we’ve heard chatter about for a long time now, but Apple is getting serious about the move according to this new report in The Nikkei. It quotes the usual industry sources saying that Apple is ‘interested’ in building its own ‘core processors’ for notebooks – as well as modem chips for iPhones, plus a single chip that takes care of multiple duties: touch, fingerprint and display driver functions. Modem chips for Apple smartphones are one thing, but building an entirely new processor for MacBooks is another entirely, because macOS is based on x86 architecture – it would require a huge amount of work to switch the operating system over to play nice with ARM CPUs. That doesn’t mean it can’t happen, though, the sources The Nikkei spoke with believe this is exactly what’s on the horizon. Although Intel, too, is driving hard for power efficiency and greater performance in its mobile processors these days – as evidenced by the recent announcement of Kaby Lake Refresh. But of course this move would also bring about independence for Apple. Also being able to bind hardware and software more tightly together, would help extract the maximum performance and efficiency from the firm’s laptops. If this is indeed a vision of the Mac’s future, Intel wouldn’t be the only supplier to get the cold shoulder from Apple. Back in the spring, Imagination Technology was told that its GPU tech would no longer be needed, because Apple will be working on its own independent graphics design down the line. Still, as we mentioned at the outset of this story, this particular ARM-comes-to-Mac rumor has been rattling around the net for a long time now, so forgive us if we don’t get too excited about the specter of big change at this point. Will we ever see ARM-driven MacBooks on our best laptops list?